Yair Lapid says his party will support the draft law if it remains in its present form, but not if it is changed at all. Yesh Atid party leader MK Yair Lapid, the chairman of the Knesset Foreign Affairs and Defense Committee, said Monday at the start of his faction meeting in the Knesset that the current 'Draft Law' is more significant than in the past, because the outline was signed off by the IDF and the Chief of Staff. "If the government changes one word in this format, it is no longer politics, it is a betrayal of every soldier who comes to the induction center," Lapid said. "The draft outline laid out by the IDF committee and the Defense Ministry is essentially a return to the law of Yesh Atid," Lapid said. "Statehood and nationalism have had their say. This time the IDF and the Chief of Staff also signed the outline." "There are significant economic sanctions on yeshivas in the plan, there are fixed recruitment targets in the law and not for political games, and if the targets are not met, after three years the criminal sanctions will return," Lapid said. 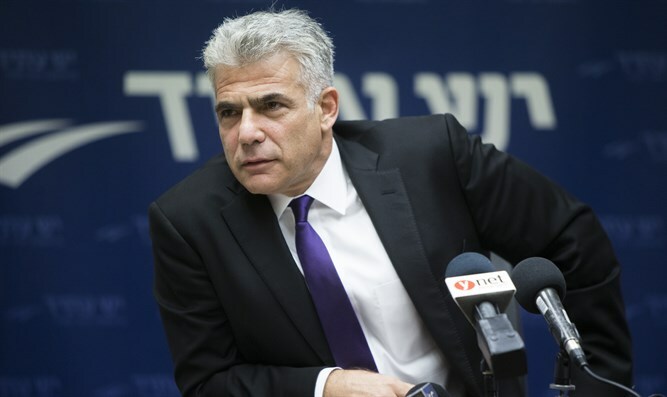 The Yesh Atid leader has made it clear that he and his party will support the bill only if it remains in its present form. "The main condition is that not a single word will change. I have no expectations from the prime minister. Surrender his art. But it is inconceivable that the defense minister will agree to change even a signal from the outline. The defense minister, the man behind [this bill], says 'word for word,' promised the public that he would give full backing to the IDF and the Defense Ministry's plans. If we change the roadmap, he gives up. There can be no surrender on this subject."